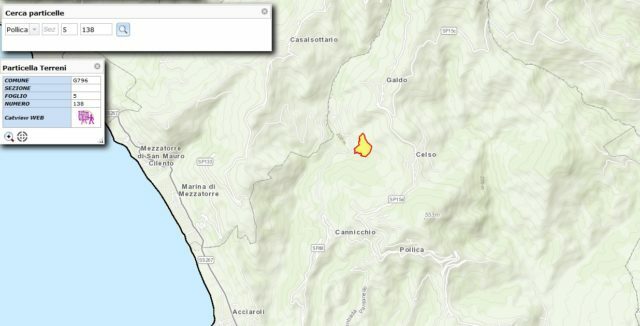 – Property Description: The property is located in Pollica (SA), few km from Agropoli and Paestum area. Its size is 74 sqm, in E1 zone (“verde agricolo”) on PRG (Piano Regolatore Generale – Masterplan), allowing the owner to restore it and add an extra 674 sqm due to residential land allowance (Indice Fondiario 0.03 mc/mq). The property is set in a 74888 sqm plot., few km from the sea. The villa will be connected to mains water and electricity, and there will be an LPG heating system. The area has good mobile phone reception for telephone and 3G internet. Renewable energy sources such as solar panels can be available on request. The town is a part of “Cilento and Vallo di Diano National Park”, whose natural environment is made up of the “maquis shrubland” typical of the Mediterranean region. It is a major tourist destination, especially during summer, because it has grown famous nationally for of its water quality, having earned the “Blue Flag beach” title and the “Five Sails” of Legambiente, an Italian environmentalist association, for several years. Cilento e Vallo di Diano National Park is the second largest park in Italy. It stretches from the Tyrrhenian coast to the foot of the Apennines in Campania and Basilicata, and it includes the peaks of Alburni Mountains, Cervati and Gelbison and the coastal buttresses of Mt. Bulgheria and Mt. Stella. The extraordinary naturalistic richness of the heterogeneous territory goes hand in hand with the mythical and mysterious character of a land rich in history and culture: from the call of the nymph Leucosia to the beaches where Palinuro left Aeneas, from the ruins of the Greek colonies of Elea and Paestum to the wonderful Certosa of Padula. And everything else you can find in such an unexplored territory.